Back in 2010 Edinburgh city council consulted on plans to spend almost half a million pounds on an exemplary “Quality Bike Corridor” linking the city centre and Kings Buildings campus in the south. We live near the Kings Buildings and so most of our journeys involve at least some riding on the route; you may well imagine that we had high hopes of the outcome of almost £1/2m of dedicated cycle redesign. There are an incredible sixty three obstructing vehicles on the 1.7 mile route at the tail end of rush hour… you’ll see I spend more time forced to ignore the “Quality Bike Corridor” features than using them. 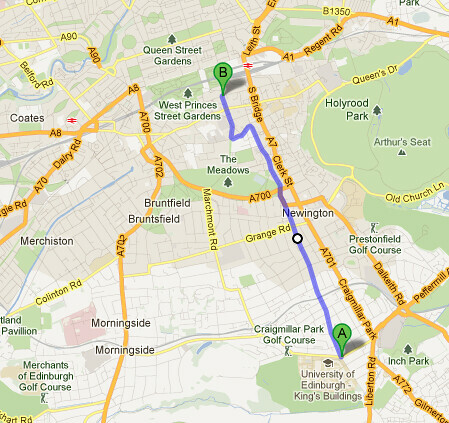 See this CityCyclingEdinburgh discussion on the same footage. At £650,000 it is not at all clear how this is an improvement on what was there before. I have been riding up an down that road since 1994, it is no safer now that it was then, and yet it is now classified as being a part of the “family friendly” cycle network. Who in their right mind would allow their eight year old child ride to school on this? I was 8 when I started riding on the road alone, and that is the age at which we teach children to ride on the roads as part of Bikeability. Over 80% of Dutch school children still cycle to school alone, but the Dutch would never describe this as “family friendly”. Unforgivably poor. Won’t they ever learn? A complete waste of money. I got doored on the hill there once by an elderly couple driving round the corner to get their messages; left hooked by someone turning into the mosque off potterow. This red paint will do nothing for those. The Potterow still radiates 40+ mph; the central reservation and pig pen says that. It’s very existence needs to be questioned. Further south, again, the pig pens by the vet school. A safer route goes through the meadows and then south; windier but quieter. This quality route? Not somewhere to take the family. Agree that this is an ill-thought through waste of money – a limp gesture towards cycling safety. What is particularly irritating about the investment (and how did they manage to spend that much?) is that there is a much safer, if a little longer, route through the Meadows and Marchmont which is also vastly more scenic but takes you between the same start and end points.